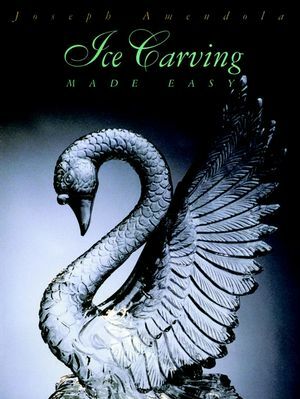 "With this new edition of Ice Carving Made Easy, Second Edition, Joe Amendola shares with all present and future ice carvers the resurgence of this historic art form. This book will guide and inspire thousands of chefs and artists to enjoy the artistic fulfillment, professionalism, and camaraderie of the exciting art of ice carving." Larry Malchick, President, National Ice Carving Association "The information on the history, tools and accessories, different methods, types of ice blocks, and the safety and precautionary measures in ice carving will be of tremendous help to many young enthusiasts in their goal to become professional ice sculptors." Hiroshi Noguchi, C.E.C., A.A.C., Executive Chef, Stouffer Orlando Resort Here is the first new American ice carving manual to be released in ten years! Written by a culinary master, Joe Amendola, it addresses current developments in the field of ice carving. It emphasizes American and European subjects and designs in an attempt to offset the exclusivity of oriental designs in available Japanese books. The organization of Ice Carving Made Easy, Second Edition allows for carvers of every proficiency to use the book with successeach stage of creating a carving is discussed, from manufacturing of ice to the final presentation. Such introductory topics as the handling of ice, hand and power tools, and templates are described in as much detail and given as much attention as the more complex sections about carving faces, fusing, and developing multiple block sculptures. Each of the 34 ice sculptures that Amendola presents is supported by step-by-step instructions that allow the novice and expert alike to create show-pieces that will add a special touch to banquets, buffets, and special events.